Both on screen and behind the scenes For The Coyotes is ripe with intimacy. With two actors and a two-person crew, it would be hard to describe it any other way. And at the end of two weeks, this team of four left a wooded cabin in Sea Ranch with the raw material that would later become this film. With two-time Emmy nominated director Eric Daniel Metzgar at the helm, For The Coyotes stars local actors Josh Schell (Best Actor 2012, SF Weekly) and "San Francisco's master actor" James Carpenter (San Jose Mercury News). 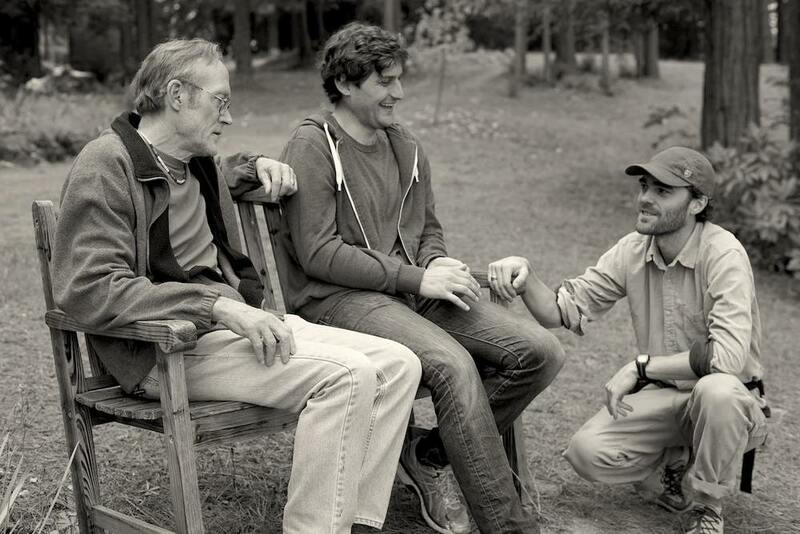 Actors James Carpenter, Josh Schell, and writer/director Eric Daniel Metzgar on set. For Metzgar, making a feature with such a small team was born of frustration. Instead of waiting on dozens of moving pieces and people he opted for a committed team of four on-set. For two weeks, Metzgar, Carpenter, Schell, and Katherine Gorringe (on sound) lived and worked together. They wore multiple hats and kept the metaphoric ship on course, each taking charge of multiple aspects of the film be it set dressing or craft services. For the Coyotes is Metzgar’s first narrative feature. His previous work resides in the domain of feature documentaries. He has directed the critically acclaimed documentaries Reporter, Life. Support. Music., and The Chances of the World Changing. Documentarians seek out truth and honesty in real world storytelling. With this background—and by seeking out and casting theater actors—Metzgar crafted a team capable of the simple honesty his script necessitated. This expression of rawness and honesty is not one that this film leans away from. Reminiscent of how a play might be staged, one of the early shots in the film is a long, still shot at a dining room table with father and son set at each end. Metzgar describes For the Coyotes as a film “about making peace with dying, making peace with the end of the self, [and] making peace with who you have been.” A practicing Buddhist, Metzgar does not shy way from posing the difficult questions that we all wrestle with throughout our lives. In his spare time, Schell’s character, aptly named Joshua, is a paraglider. In the film, he tells his father a story about what it is like. He shares with his father the peace that he feels while drifting through the sky. He tells his father landing is the hardest part. Both characters, while at different places in their lives, are in the same place together: trying to figure out how to land. You can watch a special screening of For The Coyotes at 8pm on Friday, July 22nd at the Delencey Screening Room by the San Francisco Embarkadero. A Q&A with director/writer Eric Daniel Metzgar and actors James Carpenter and Josh Schell follow. For more information you can go to the facebook event at https://www.facebook.com/events/1620069748215508/ or tickets can be purchased here.